The Environmental Protection Agency is now evacuating thirteen residents near the CTS of Asheville Superfund site, due to contamination of the air in and around their homes with the carcinogen trichloroethylene (TCE). CTS Corporation used TCE as a degreasing agent while they operated their Asheville-based facility from 1959 until 1986. 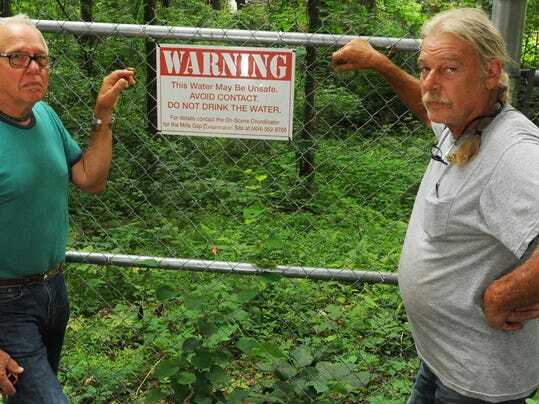 Bob Taylor, left, and Terry Rice, stand next to a sign warning of contaminated springs on the property where they live next to the former CTS plant (credit: Asheville Citizen-Times). For several months now, POWER Action Group has been urging the EPA to conduct an interim removal action at the CTS site because of risks of exposure to area residents. Finding these high levels of TCE in the air vapor assessments is further proof that the contamination is migrating, poses a threat to human health and the environment, and that the source must be removed immediately.